The Wicklow Black Shower Curtain brings a classic touch to your bathroom! Measuring 72"x 84" with a Black & Khaki for your country home by Park Designs . 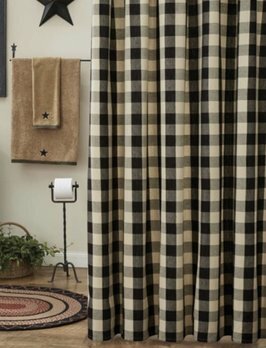 These Panel Curtains are a checked pattern in Black and Khaki, check squares approx. 1 3/4 inches. The Wicklow Lined Panels Black measure 72"x 84" with a Black & Khaki for your country home by Park Designs . 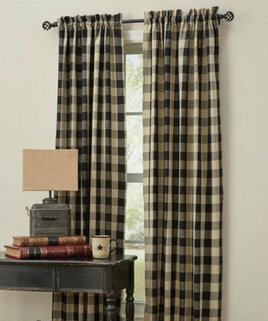 These Panel Curtains are a checked pattern in Black and Khaki, check squares approx. 1 3/4 inches. The beautiful Wicklow Black Swag provides the perfect window treatment for any country home! 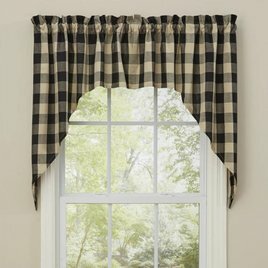 Sporting a warm tan & black traditional check pattern, this unassuming design is both pretty and practical! They come unlined to allow soft light to filter thru! 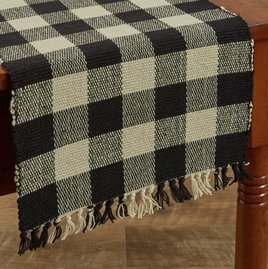 ou'll love the traditional look of the Wicklow Table Runner from the Wicklow Black Collection. Created by Park Designs this is a classic checkerboard pattern with a color scheme of black and beige. Measures 13" x 36".